1. Comical, outlandishly extravagant: Many people prefer zany comedy to sophisticated humor. 2. Nonsensical, hairbrained, or bizarre: Come on, Ralph, don't be such a zany person. Be serious for a change. 3. Etymology: Giovanni (John) was for a long time a common name in Italy, and in Venice a pet name for Giovanni is Zanni. Venetians must have had a lot of servants called Zanni because the name became associated with a type of clown or buffoon who played humorous servants in early Italian comedies or a commedia dell'arte. From this clownish character, the zanni, we get the English word zany. 1. To attack, to destroy, or to kill someone or something quickly: The news indicated that much of the fruit in Southern California was zapped by freezing weather. 2. To hit something or someone with electrical power: The lightning was responsible for zapping the power supply in the neighborhood. 3. To shoot something or someone with an electric gun, a laser, etc. : The dermatologist zapped a mole on Jim's back with a laser. 4. To change the channels on TV by using a remote control: Polly was zapping through the various programs in an effort to find one that she wanted to see. Descriptive of destruction that is caused by electronic sources, both natural and man-made: The thunderstorm resulted in several cases of zapped trees and zapped electrical power lines. 1. An electronic device which attracts and kills bugs: Lou used an insect zapper to kill the hundreds of pests flying around the porch light. 2. Anything that is considered to be capable of exterminating or destroying something: Some films show wars going on with zappers shooting each other down. 3. In computer programming, a reference to a command in some database programs which erases all the data in a file or a spreadsheet all at one time: When Adam bought a new computer, all of the data in the old machine was changed over to the new machine and then a zapper program cleaned out his old computer. 1. The ideas prevalent in a period and place, particularly as expressed in literature, philosophy, and religion: The zeitgeist of the 1920s seemed to be lighthearted. 2. The spirit of the time; the spirit characteristic of an age or generation: The zeitgeist of the new century was characterized by apprehension and curiosity. 3. The general intellectual, moral, and general cultural taste characteristic of an era: Please tell James about the zeitgeist of the time when he was growing up. 4. Etymology: from German Zeitgeist; literally, "spirit of the age"; from Zeit, "time" plus Geist, "spirit". 1. The point in the sky directly above an individual: John looked up into the sky after dark and saw the moon at its zenith. 2. High point, peak, best moment: Being elected mayor was the zenith of Bill's political career. 3. Most successful, peak, greatest success: The United States was at its zenith before Donald Trump became President. 4. Etymology: from Arabic samt, "path over the head". The Arabic samt became the English zenith because a medieval scribe copied the word samt incorrectly, making it "senit", which became our zenith. Another explanation: about 1387, from Old French cenith then French zénith; which came from Medieval Latin (Latin as written and spoken c.700-c.1500) cenit, senit, a bungled scribal transliteration of Arabic samt, "road, path"; an abbreviation of samt ar-ras, literally, "the way over the head". 2. 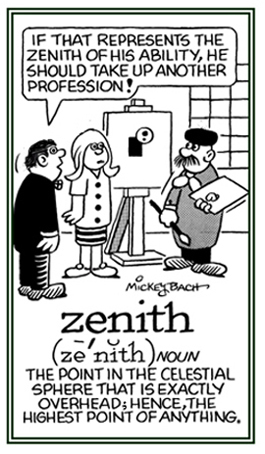 Etymology: from French and German Zickzack, "an alteration of direction." Characteristic of having a situation in which there is veering back and forth to the right and to the left: When some animals are being chased by a predator, they often take a zigzag procedure in an effort to escape being caught. A reference to moving back and forth from left to right: The taxi driver must often drive zigzag across the city to deliver his customers. 1. To move along in a back and forth or right to left procedure: The trail up the mountain was zigzagging all the way to the top. 2. Etymology: from French which came from German Zickzack, "the alternation of directions" which may have applied to fortifications. Monetary institutions which are financially insolvent; yet, they continue to operate with government support: The zombie banks continued to exist with government funding despite the fact that they were actually unable to meet or to discharge their fiscal obligations. 1. A corpse which is believed to be reanimated through supernatural forces: A mysterious power or spell that according to voodoo belief can enter into and revive a zombie. 2. A person who acts or responds in a mechanical or apathetic way: Henry was so tired that he was walking around like a zombie. 3. Etymology: from Caribbean French, and English Creole which came from Kimbundu-zumbi, "ghost, departed spirit". Originally the term zombie was the name of a snake god, then later it meant "a reanimated corpse" in the voodoo cult. 1. Like or resembling a soulless corpse said to have been revived by witchcraft; formerly, the name of a snake-deity in voodoo cults of or deriving from West Africa and Haiti: Zombiesque humanoids are considered to be reanimated dead bodies and so they are then thought to belong to the living dead. 2. Characterized by being dull, apathetic, or a slow-witted person: Some people are labeled as being zombiesque because they are so lifeless and unfeeling. The transformation of a person or people into living dead existences: The zombification of some people is a result of a combination of drugs, unemployment, having no real objectives or purposes in life, and a lack of training or education that would give them the tools they need to achieve their objectives. 1. To turn into a member of the living dead or undead: The young woman managed to get away from the sorcerer who had attempted to zombify her and, as a result, she was able to enjoy the rest of her life. 2. To deprive of energy or vitality: It was obvious that the screaming children were zombifying their parents. 3. To insert a system in a computer in order to send out spam: There are some computers that are taken over by hackers and zombified to perform malicious tasks and so become spam zombies. A zombified computer is one that is controlled by another person without the owner's knowledge and used for sending spam or performing other illegal or illicit activities.